Over the past few weeks the two parties’ House campaign arms, the Democratic Congressional Campaign Committee and the National Republican Congressional Committee, have begun to roll out their lists of vulnerable seats and of the opposing seats they are targeting. The primary purpose for these lists is, of course, fundraising. They are a flashing billboard to loyal donors, alerting them as to which candidates they should support and incumbents they should oppose. Beyond that, the lists serve as a signal to certain incumbents, hinting broadly to the ones who should be working hard early in the cycle because they are vulnerable. The parties are also reassuring preferred challengers that they will have national financial support if willing to run in a targeted district. So far, the NRCC has named 19 Democratic incumbents it has identified as vulnerable, as well as 12 potentially vulnerable Republican incumbents who are in its Patriot Program. Meanwhile, the DCCC’s Frontline program names 14 most vulnerable members, and its One-Term Wonders feature 16 mostly first-term Republicans that the party is targeting. (The comparable Republican list does not at this point have a snazzy name.) The DCCC says that there are more GOP targets to come, which makes sense given the party’s deep deficit in the House: Democrats would need to net 30 seats next year to take the House majority. Overall, the GOP holds a daunting 245-188 edge in the House right now, with two vacancies that the Republicans should hold in upcoming special elections (more on those races below). Significantly, the lists are useful to House watchers because, when combined, they show which seats both sides openly agree are in play in 2016. Tables 1 and 2 show the Republican and Democratic seats that appear on both parties’ lists of top targets and vulnerable members. In other words, to appear in these tables, a Democrat would have to have a place on both the GOP’s list of targets as well as the Democratic Frontline program, and a Republican would have to have won notice on the GOP’s Patriot Program as well as the Democrats’ One-Term Wonders. Sources: The Almanac of American Politics 2014 for 2012 Obama/Romney numbers, the Cook Political Report’s National House Popular Vote Tracker for 2014 results. All results rounded to the closest whole number. Of the 11 Republicans in Table 1, none were in the House in 2012. So these are 2014 wave winners whom the GOP will have to protect in what should be a less favorable climate in 2016. They are not all technically first-termers, though: Reps. Robert Dold (R, IL-10) and Frank Guinta (R, NH-1) won their first terms in 2010, lost in 2012, and then avenged their defeats in 2014. 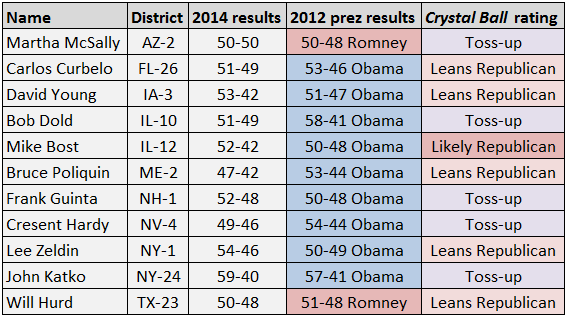 Of these 11 seats, nine were won by Obama in 2012, so if Democrats gain seats on the overextended Republicans in 2016, these are some of the first ones that could fall. Of the 12 Republicans listed in their Patriot Program, 11 appear here. The only one who does not, Rep. David Valadao (R, CA-21), was first elected in 2012 and thus does not fit the Democrats’ “one-term” rubric. But when Democrats release their next list of longer-serving Republican targets, Valadao will be included: His district is one of the most Democratic held by any Republican, giving Obama 55% of the vote in 2012. It also is more than two-thirds Hispanic, which poses both a turnout challenge and an opportunity for Democrats in a presidential year. Five of the Democrats’ 16 One-Term Wonders are not listed by the Republicans on their Patriot list, which indicates some disagreement between the parties on their vulnerability. They are Reps. David Jolly (R, FL-13), Rod Blum (R, IA-1), Tom MacArthur (R, NJ-3), Ryan Costello (R, PA-6), and Barbara Comstock (R, VA-10). On four of these five, we agree with the Republicans that they do not start off the cycle as very vulnerable: Jolly was unopposed in 2014 after winning a very competitive special election earlier in the year, and MacArthur, Costello, and Comstock all won by at least nine points last November. We rate all as Likely Republican: Democrats will have to prove through recruiting and fundraising that these seats are truly in play. Blum’s seat is a different story: He won by less than three points in 2014 and sits in one of the most Democratic seats held by any Republican (56%-42% Obama in 2012). That makes him one of the likeliest House incumbents on either side to lose in 2016. So why is he not listed by the Republicans on their list of seats to defend? Probably because he voted against Speaker John Boehner (R, OH-8) in last month’s leadership vote. This is payback. We know you’re shocked that such a thing could happen in politics — but take some deep breaths and continue reading. Blum will be a highly courted Iowa Republican this year: For instance, he’s holding an event with Scott Walker next month. But while GOP presidential candidates are going to be beating a path to his door as they compete in the opening contest of the presidential nominating season, the national party could very well hang him out to dry given how hard it will be to hold his seat, not to mention the fact that he’s not playing ball with leadership. Or maybe he’ll be added to the list later if there’s some kiss-and-make-up. The 14 Democrats in Table 2 are mostly 2014 survivors, and they should benefit from 2016 turnout. That particularly goes for the five Californians on this list: If the GOP could not win these seats in 2014 there’s no real reason to think they will win them next year, assuming no scandals or retirements. All of these members first won in 2012 or 2014, although Reps. Ann Kirkpatrick (D, AZ-1) and Rick Nolan (D, MN-8) previously served in the House prior to their 2012 victories (like Dold and Guinta on the Republican side). Something to watch among this group is whether Reps. Patrick Murphy (D, FL-18) or Kyrsten Sinema (D, AZ-9) runs for the Senate. Both would be potentially strong statewide candidates, and their seats, particularly Murphy’s, would be hard for Democrats to hold without their incumbents. The Republican target list has an additional five names not listed on the Democrats’ Frontline defensive roster. One of them, Rep. Ben Ray Luján (D, NM-3), is included merely for trolling purposes: Luján is head of the DCCC. But his district is much too Democratic, 58%-39% Obama in 2012, to be an actual Republican target in a presidential year. Also mostly a “take that!” mirage is the inclusion of Rep. Steve Israel (D, NY-3), who is Luján’s predecessor as DCCC chairman. Israel has not had a hard race since his initial election in 2000, and there’s not much reason to think he will have trouble in 2016. Yet his district is only about as Democratic as the nation as a whole, so it could be competitive under some theoretical circumstances. We call it Safe Democratic in our ratings owing to Israel’s established strength, but it’s not impossible that the right Republican could push him a bit. The other three Democrats who appear on the Republican but not the Democratic list are: Rep. John Garamendi (D, CA-3), who had a somewhat close call in 2014 but will be even harder to beat with 2016 turnout; Rep. Elizabeth Esty (D, CT-5), who did better in 2014 than in her initial 2012 election; and Collin Peterson (D, MN-7), who holds the most Republican seat held by any Democrat in the nation. Yet Peterson has a strong local presence, and Republicans may be simply trying to goad him into retirement. Again, assuming no scandals or retirements — a big “if” in the 70-year-old Peterson’s case, although he said recently that he’s “running at this point” — we don’t consider any of these five aforementioned members to be especially vulnerable. Ultimately, there are just 25 seats listed in Tables 1 and 2 where there is a consensus among Democrats and Republicans that the races should be competitive, and we’re not even sure we’d go that far: Several of the seats the Crystal Ball has already categorized as Likely for one side or the other, so it is not obvious to us that they will be competitive. 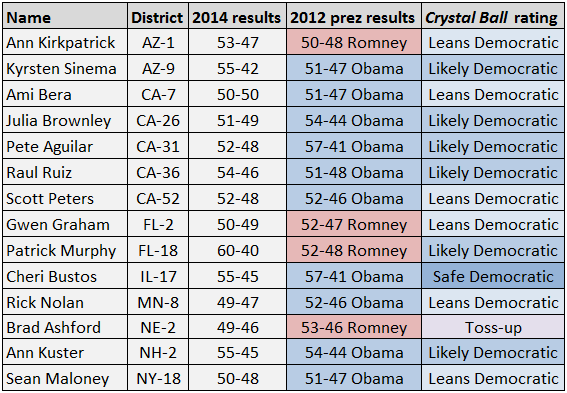 Another appears in the Crystal Ball as Safe Democratic (IL-17, held by Rep. Cheri Bustos). More races will obviously come into play, and remember that the Democrats have more Republican targets to unveil. However, there’s little reason to expect at this point that more than about 50-60 seats — and probably fewer — will be truly competitive in the general election. That’s barely more than a tenth of all 435 House seats. Overall, our outlook is for the Democrats to end the cycle in 2016 with more seats than they hold now, but the Republican majority is secure, barring a massive Democratic wave. — The House campaign, understandably, is mostly in a state of hibernation, but we do have one rating to change. Rep. Tim Walberg (R, MI-7) has always been a bit more conservative than his southern Michigan-based seat. Obama won it in 2008, and Romney won it in 2012, so it can swing even though it has a small Republican lean. Walberg first emerged on the national scene by primarying a moderate Republican congressman, Joe Schwarz, in 2006. Walberg then narrowly won the seat in the general, lost it in 2008, and then recaptured it in 2010. Democrats have a potentially strong challenger, state Rep. Gretchen Driskell (D), a candidate respected by some of our Republican sources. We’re moving this race from Likely Republican to Leans Republican. — Gov. Andrew Cuomo (D-NY) stubbornly refused to schedule a special election to replace disgraced former Rep. Michael Grimm (R, NY-11) until a judge last week ordered him to do so. Cuomo has now set the election for May 5. In New York, the parties choose the candidates. The Republican nominee will be popular Staten Island District Attorney Daniel Donovan, and the Democratic candidate appears likely to be New York City Councilman Vincent Gentile of Brooklyn. A Brooklyn candidate could not have been the first choice of Democrats because Staten Island dominates the district, but bigger names decided not to run. We took a detailed look at this district and special election last month, and there’s been no indication since then that Democrats are going to strongly contest this special election. The race rating remains Likely Republican, and that designation might still be generous to the Democrats. — The recent death of Rep. Alan Nunnelee (R, MS-1) from brain cancer has triggered a special election for the seat. The field of candidates remains largely unformed: Sam Hall of the (Jackson) Clarion-Ledger has a useful rundown of the possibilities, who have until March 27 to enter the race. Earlier this week Gov. Phil Bryant (R) set the special election for May 12 with a runoff if needed on June 2. A runoff is likely: All candidates run together on the same nonpartisan ballot, so presumably no one will get over 50%. This is a seat Mitt Romney won with 62% in 2012, so it should be a Safe Republican hold even though ex-Rep. Travis Childers (D) captured it in a 2008 special election and then held it in the ’08 general, before losing to Nunnelee in 2010. Childers succeeded when George W. Bush was in the White House; under Obama, one would expect a different outcome.